Double the sound â and the party! â with this versatile speaker from JAM. One alone is awesome, but with this convenient package, you can pair them for spectacular stereo sound. This ultra-portable speaker can go anywhere (and since itâs splash proof, it really loves to hang by the pool). Combine two JAM DOUBLEDOWN speakers for rich stereo sound. Rock out by the pool! A little water wonât hurt this tough speaker. Features a rubberized body for maximum durability. Connect wirelessly with any device in a 30-foot range via Bluetooth. Provides up to 6 hours of play time on a single charge. 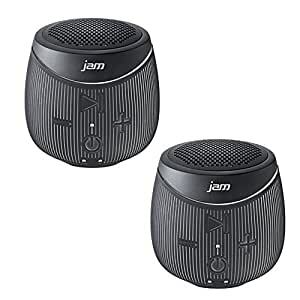 Answer calls directly from your JAM DOUBLEDOWN speaker. Cord it up and listen on any device â Bluetoothâ¢ or not.